Author’s Note: This post imagines a dystopian future for web video, if we continue to rely on patented codecs to transmit media files. What if one company had a perpetual monopoly on those patents? How could it limit our access to media and culture? The premise of this cautionary tale is grounded in fact. However, the future scenario is fiction, and the entities and events portrayed are not intended to represent real people, companies, or events. The year is 2029. It’s been two years since the start of the Video Wars, and there’s no end in sight. It’s hard to believe how deranged things have become on earth. People are going crazy because they can’t afford web video fees – and there’s not much else to do. The world’s media giants have irrevocably twisted laws and governments to protect their incredibly lucrative franchise: the right to own their intellectual property for all time. It all started decades ago, with an arcane compression technology and a cartoon mouse. As if we needed any more proof that truth is stranger than fiction. In 1998, the U.S. Congress passed the Sonny Bono Copyright Term Extension Act. This new law extended copyrights on corporate works to the author’s lifetime plus 95 years. The effort was driven by the Walt Disney Company, to protect its lucrative retail franchise around the animated character Mickey Mouse. Without this extension, Mickey would have entered the public domain, meaning anyone could create new cartoons and merchandise without fear of being sued by Disney. When the extension passed, it gave Disney another 20 years to profit from Mickey. The news sparked outrage from lawyers and academics at the time, but it was a dull and complex topic that most people didn’t understand or care about. In 2020, Disney again lobbied to extend the law, so its copyright would last for 10,000 years. Its monopoly on our culture was complete. No art, music, video, or story would pass into the public domain for millennia. All copyrighted ideas would remain the private property of corporations. The quiet strangulation of our collective creativity had begun. A small but powerful corporate collective called MalCorp took note of Disney’s success. Backed by deep-pocketed investors, MalCorp had quietly started buying the technology patents that made video streaming work over the internet. It revealed itself in 2021 as a protector of innovation. But its true goal was to create a monopoly on video streaming technology that would last forever, to shunt profits to its already wealthy investors. It was purely an instrument of greed. Now, there were some good guys in this story. As early as 2007, prescient tech companies wanted the web platform to remain free and open to all – especially for video. Companies like Cisco, Mozilla, Google, and others worked on new video codecs that could replace the patented, ubiquitous H.264 codec. They even combined their efforts in 2015 to create a royalty-free codec called AV1 that anyone could use free of charge. AV1 was notable in that it offered better compression, and therefore better video quality, than any other codec of its time. But just as the free contender was getting off the ground, the video streaming industry was thrown into turmoil. Browser companies backed different codecs, and the market fragmented. Adoption stalled, and for years the streaming industry continued paying licensing fees for subpar codecs, even though better options were available. Meanwhile MalCorp found a way to tweak the law so its patents would never expire. It proposed a special amendment, just for patent pools, that said: Any time any part of any patent changes, the entire pool is treated as a new invention under U.S. law. With its deep pockets, MalCorp was able to buy the votes needed to get its law passed. MalCorp’s patents would not expire. Not in 20 years. Not ever. And because patent law is about as interesting as copyright law, few protested the change. Things went downhill quickly for advocates of the open web. MalCorp’s patents became broader, vaguer, ever-changing. With billions in its war chest, MalCorp was able to sue royalty-free codecs like AV1 out of existence. MalCorp had won. It had a monopoly on web streaming technology. It began, slowly at first, to raise licensing fees. For those who could afford it, web video got much better. MalCorp’s newest high-efficiency video codecs brought pixel-perfect 32K-Strato-Def images and 3D sound into people’s homes. Video and audio were clear and rich – better than real life. Downloads were fast. Images were crisp and spectacular. Fees were high. Without access to any competing technologies, streaming companies had to pay billions instead of millions a year to MalCorp. Streaming services had to 100x their prices to cover their costs. Monthly fees rose to $4,500. Even students had to pay $50 a minute to watch a lecture on YouTube. Gradually, the world began to wake up to what MalCorp had done. By the mid-twenties, the Robotic Age had put most people out of work. The lucky ones lived on fixed incomes, paid by their governments. Humans were only needed for specialized service jobs, like nursery school teachers and style consultants. Even doctors were automated, using up-to-the-minute, crowd-sourced data to diagnose disease and track trends and outbreaks. People were idle. Discontent was rising. Where once a retired workforce might have traveled or pursued hobbies, growing environmental problems rendered the outside world mostly uninhabitable. People hiked at home with their headsets on, enjoying stereoscopic birdsong and the idea of a fresh breeze. We lived indoors, in front of screens. It didn’t take long for MalCorp to become the most powerful corporation in the world. When video and mixed reality files made up 90 percent of all internet traffic, MalCorp was collecting on every transmission. Still, its greed kept growing. Fed up with workarounds like piracy sites and peer-to-peer networks, MalCorp dismantled all legacy codecs. The slow, furry, lousy videos that were vaguely affordable ceased to function on modern networks and devices. People noticed when the signal went dark. Sure, there was still television and solid state media, but it wasn’t the same. Soon enough, all hell broke loose. During Super Bowl LXII, football fans firebombed police stations in 70 cities, because listening to the game on radio just didn’t cut it. Thousands died in the riots and, later, in the crackdowns. Protesters picketed Disneyland, because the people had finally figured out what had happened to their democracy, and how it got started. For the first time in years, people began to organize. They joined chat rooms and formed political parties like VidPeace and YouStream, vying for a majority. They had one demand: Give us back free video on the open web. They put banners on their vid-free Facebook feeds, advocating for the liberation of web video from greedy patent holders. They rallied around an inalienable right, once taken for granted, to be able to make and watch and share their own family movies, without paying MalCorp’s fees. But it was too late. The opportunity to influence the chain of events had ended years before. Some say the tipping point was in 2019. Others blame the apathy and naiveté of early web users, who assumed tech companies and governments would always make decisions that served the common good. That capitalism would deliver the best services, in spite of powerful profit motives. And that the internet would always be free. Judy is a Technical Writer working with Mozilla. She has written about open source software for many years and now focuses on the open web platform. You need someone to animate this. Think of the Animatrix in style to give it that dramatic vibe. If you combine it with good music it could go viral. Maybe put some elements of V for Vendetta in it. I’ve learned that each one of us should support the development of open initiatives and stay informed about new proposed laws. I have no idea what you want me or others to do, even after reading this 3 times. That’s a valid point. 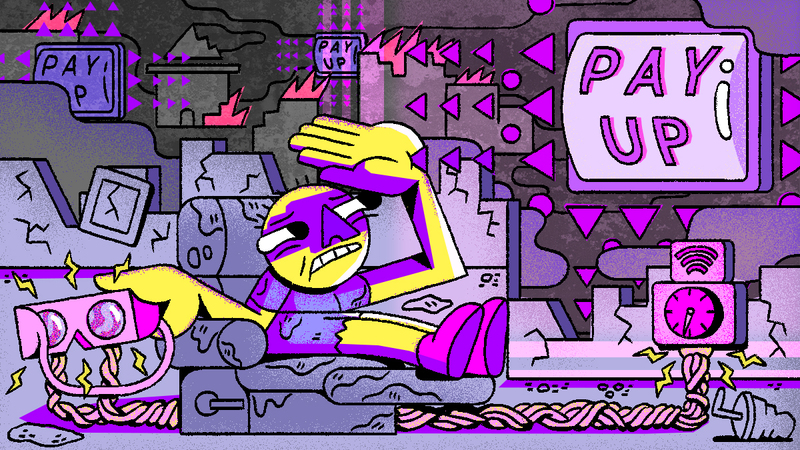 The goal of this piece was to raise awareness of the issue of patented video codecs and how they add cost to the web’s streaming infrastructure — a cost we don’t see as users, but is there nonetheless. What can we do about it? Support open source efforts to establish alternative codecs, in whatever way you can. If you could add some links to further material on what’s happening (in 2018/19); could be useful to continue the narrative. Great idea, Ajai! Here my previous “explainer” piece on AV1 & modern codecs, An Invisible Tax on the Web: Video Codecs. I found the Bitmovin website super helpful to understand current market dynamics. Blog posts like: Get Ready for a Multi-Codec World. And they have good diagrams, like which companies support the different High-Efficiency codecs and a timeline of the history of when each codec came on the scenes. Maybe to try and make sure rampant pollution and wildfires are not part of our near future? and use Ogg format for anything you publish that you want accessible in 20 years? Thanks for telling the story. We can all support open-source software. Unfortunately this vision isn’t so unbelievable as one might think. Those with the fattest wallets will always make the rules ant it won’t be to the benefit of common people. Totally agree. When I started writing this, I was reaching for the wildest, most far-out scenario I could think of. By the time I was done with revisions, the story seemed uncomfortably plausible. We put our trust in the MPEG-LA to do the right thing. For those who might think this is far-fetched. Many years ago a German friend of mine who ran a one-man free radio station playing his own and friends’ music got together with those friends to give a free concert in a park. Before they got started, GEMA (German PRS) arrived, backed up by police. The concert couldn’t go ahead because they weren’t licensed by GEMA for public performance. It didn’t matter that all the music was their own and none of it was subject to anyone else’s copyright. No, they couldn’t buy a license because they weren’t the sort of people GEMA dealt with. A week or so later the police raided his home and took away all his equipment. This is not only applicable for video streaming, its applicable everywhere when profit making becomes the only motive over the wellbeing of society. Stephan Kinsella is one great resource for ethical/moral/economical arguments against intelectual property, in case you (or someone) are interested. Having google mentioned as one of the good guys feels a little quaint. WE ARE SO CLOSE TO BEING IN THE STATE THIS STORY DESCRIBES…L!G! Unless every monied big interest like Netflix and Google just stepped aside, something like this couldn’t happen. It’s also not clear how copyright extension fits into this, because you’re not really talking about copyrights. You’re talking about a patent system that’s out of control, and different from the one that exists today. It’s also unlikely that we’ll all be stuck at home because of global warming by 2029. But, that said, we sort of do that voluntarily these days. Doesn’t have anything to do with the air or the temperature. Have you been outdoors lately? There’s never anyone on the streets. You have a point that there are powerful corporations that could object to a raise in patent royalties. And that patent law is different from copyright law, which has few defenders. But I don’t agree this is an entirely silly scenario, as you suggest. As the story lays out: the U.S. copyright law has already been amended to favor copyright holders — more than once, as it happens. Who’s to say patent holders couldn’t do the same thing? Yes, interested corporations could fight an amendment to the law. But who says the “better” corporate taskmaster will prevail? We’re talking about an awful lot of money changing hands now and in the decades to come. That’s a big incentive for patent holders to find a way. Point #2: HEVC royalties are estimated to cost ten times more than H.264. Are trillion-dollar companies like Apple paying them today? Yes they are. Because they don’t have a choice. It’s the cost of streaming media on the web. And it’s the law. So I’d argue, it’s happening now. Big companies are already being held ransom for high royalty payments if they want to upgrade to hi-def streaming. The question is, how long will this situation continue? 20 years, until the patents expire? Or forever? Point #3: I never said the environment problems were caused by global warming. Could be smoke, volcano eruptions, thermonuclear mishaps, you name it. But it is folly to assume we can continue to pollute our planet without repercussions, some of which we are already experiencing. I for one get very grouchy when the air quality is so poor that I can’t ride my bike. Happily, today is not one of those days.